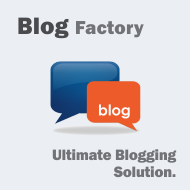 Blog Factory is a FREE, user and webmaster friendly blogging extension for Joomla, with a native and fresh look. Packing up various features, it is a brilliant alternative to Wordpress blogging, allowing you to use Joomla versatility and well known blogging conventions like RSS Syndication, Bookmarking Sites (Twitter, Facebook, etc). Featuring a Web 2.0 Dashboard with with drag-and-drop panes and all-in-reach controls, your blogging experience will be truly comfortable and within a luxuriant environment. With integrated commenting and following system, Blog Factory does not need additional extensions in order to function at its full potential. No need to get support from 2 different extension providers that keep pointing fingers at each other's program. User Avatars, Pingbacks, TinyMCE extensions, Youtube integration, Media management add to the Extension an amazing set of features and possibilities. How to use the DEMO site of Blog Factory? You can use the login buttons on the left in order to login into the site as different users and test the features of this extension. You can approve comments, leave comments, add posts, and even login into the administrative backend to see all the management features.